S.S. Herspring Company was founded by Sidney Herspring in 1921. The primary business was private label canned good sales – a new concept at the time. Mr. Herspring was known widely throughout the industry for his hard work and high integrity. We continue his high standards as our legacy. 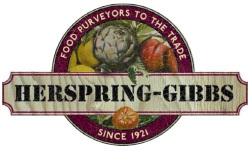 our company today brings together 2 longtime foodservice families to form Herspring-Gibbs LLC. We take pride in our quality products, exemplary service and unquestionable integrity that has enabled us to develop long term partnerships with our Principals, Distributors, and Customers. We are dedicated in building profitable relationships, increasing sales opportunities and responding to customer’s needs. As member of the IBA our goal is to be the leading Independent Foodservice Broker in Northern California with an emphasis shown to our locally grown, sustainable and local market trends. Herspring-Gibbs is a San Francisco Bay Area owned and operated firm that conducts business in the Northern California and Western Nevada (Reno/Tahoe area), hotbeds for foodservice trends. We have 8 sales managers located in key markets throughout Northern California. Our Sales staff has over 150+ combined years’ experience in the foodservice business and have 3 trained chefs on our team. Our business territory stretches from Fresno, CA in the South to the California-Oregon border. Our company offices are centrally located in San Ramon and are close to 3 major airports. Our office is equipped with a full kitchen and conference room that can be used to conduct sales meetings and product cuttings. In working with Herspring-Gibbs, you get a Top to Top partnership and mutually focused sales goals. Our customer service staff is identified as one of the best in Northern California. No phone call to the office will go unanswered during regular business hours. Since 1921, Herspring-Gibbs has been providing the highest levels of sales and service to the restaurant industry in Northern California and Northern Nevada. As an independent food broker with long family traditions in food service, Herspring-Gibbs is positioned to partner with you to profitably grow your business.